John Moloney is standing for the Assistant General Secretary position in the Public and Commercial Services union (PCS), as part of an Independent Left slate for the union's National Executive Committee. He spoke to Solidarity about his election campaign, and PCS's current ballot for industrial action over pay in the civil service. Read more about Equalise civil service pay! The next Workers’ Liberty London forum will feature John Moloney, a candidate for Assistant General Secretary of the civil service union PCS. PCS leaders claim that theirs is “the fighting union”. John will argue that rank-and-file democracy, officials on a worker’s wage, and a fight to level up to national pay rates, are needed to move from “fighting” talk to effective reality. Industrial officials are never wrong? 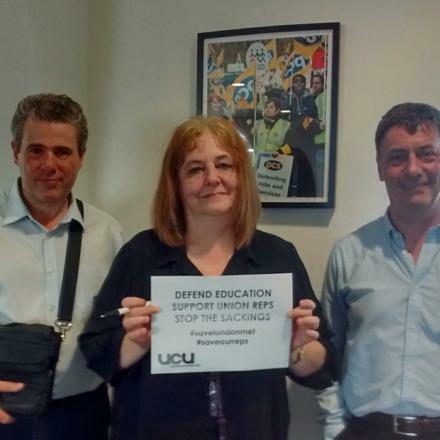 “We, the lay members of PULS, stand in solidarity with our left officers and organisers. We know they will always do the right thing.” So says a recent open letter recently from “Progressive United Left Scotland” (PULS), a faction in Unite the Union launched in 2016 because of the supposed demise of the existing United Left Scotland (ULS). Read more about Industrial officials are never wrong? The civil service union PCS has just completed a membership consultation on the 2019 civil service pay claim and campaign plan. John Moloney is the Independent Left candidate for Assistant General Secretary of the civil service union PCS. Nominations opened on 17 January, and close on 7 March. Voting will run from 16 April to 9 May. Three rival candidates from the “broad left” bloc which has run the union for many years are also in play — Chris Baugh (the incumbent), Stella Dennis, and Lynn Henderson — though one of those may withdraw. Moloney has given an interview to The Clarion outlining his platform in detail. Amidst farcical discord in the dominant Left Unity faction of the civil service union PCS, nominations open on 17 January for the union’s Assistant General Secretary. Voting will run from 16 April to 9 May. 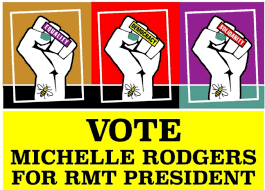 Michelle Rodgers has been elected president of the National Union of Rail, Maritime, and Transport workers (RMT), becoming the first woman president in the union’s history. She won a comprehensive victory, with 7,198 votes; her two opponents, Steve Shaw and Jamie Nickles, took 4,598 and 443 votes respectively. Click here for longer version of this article. In November, the PCS Independent Left (PCS IL) selected John Moloney, a genuine rank and file PCS activist with an outstanding campaigning and negotiating record, to contest the 2019 PCS election for Assistant General Secretary (AGS). Nominations open on 17 January, and voting will run from 16 April to 9 May. The Independent Left group in the PCS civil service workers’ union is standing John Moloney for Assistant General Secretary. Nominations open on 17 January, and balloting will run from 16 April to 9 May. The political platform on which John Moloney is standing is summarised here. Now that the Public and Commercial Services union is on course for another national ballot in March 2019, a key question is what we need to do to beat the 50% turnout threshold this time. One option might be a disaggregated ballot.